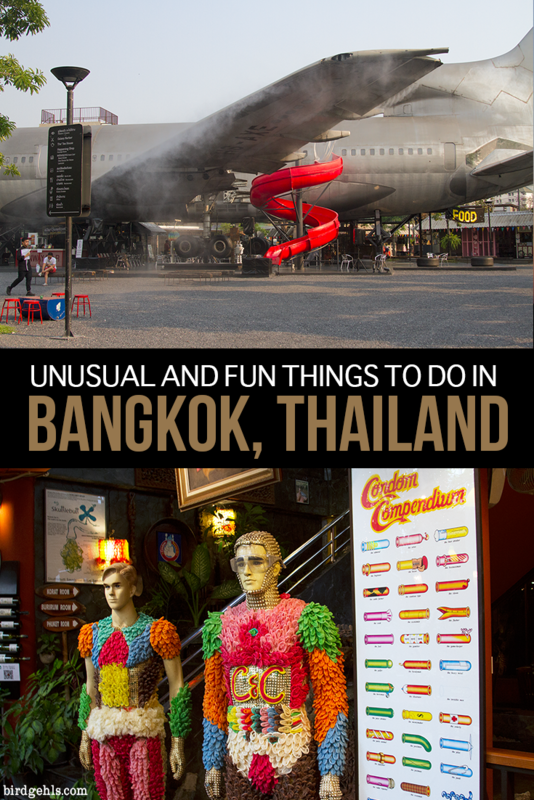 There are many unusual things to do in Bangkok. 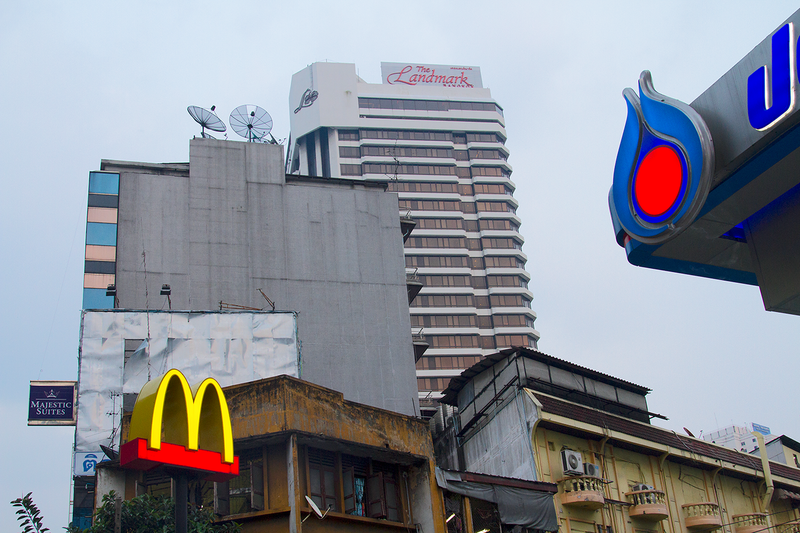 Bangkok is a place of contrasts. I’ve heard it described as “just another big city” in the past by many people. Yet, cities the size of the Thai capital surely have their own secrets and array of interesting experiences. You probably just need to dig below surface level and then you can find some really unusual things to do in Bangkok. A recent trip to Thailand would see me flying in and out of the city and I had roughly three days up my sleeve to explore. So, I decided to set the more popular activities firmly aside for this trip (Bangkok is pretty close to Australia and I’m sure I’ll be back in the future) and see what I could uncover. I was certain there’d be some non-touristy things to do in Bangkok and I wasn’t wrong. Turns out, there’s some pretty odd stuff going on below surface level. When I told pretty much anyone at home what I was doing in this city, the main response was “you’re a weirdo”. Whatever. I’m embracing the weird. It makes life interesting, after all. So, here are some alternative things to do in Bangkok. 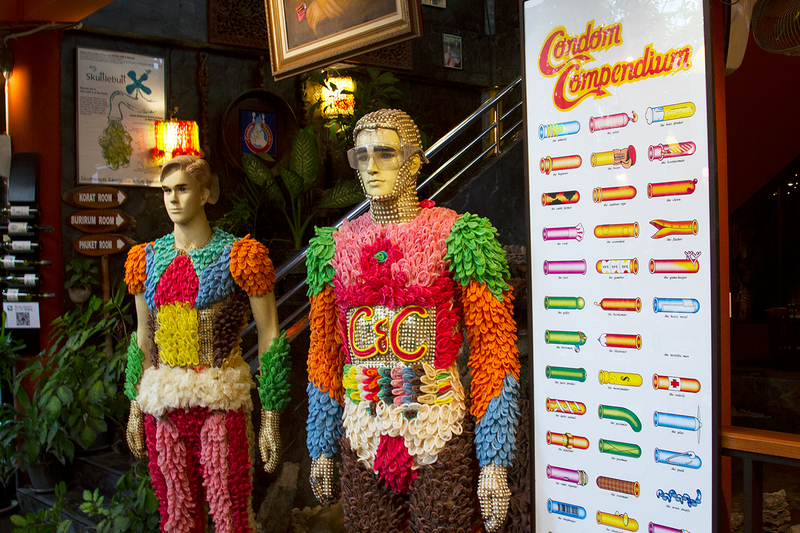 Try them out yourself next time you’re in Thailand’s biggest city – if you’re up for it. I’ve been to my fair share of odd museums around the world (here I was, naïvely thinking the Icelandic Phallological Museum would forever take the cake) and the Siriraj Medical Museum might just top this list. Located in Siriraj Hospital, the museum’s collection is just… strange. Its theme is generally “medical anomalies”. It contains deformed babies in jars (conjoined twins, babies born with half a head or with their legs stuck together), fairly graphic photographs of people killed in horrible manners (like from gunshot wounds, molotov cocktails and a motorbike accidents). There are jars upon jars of vital organs that have been maimed in some way, whether through traffic accidents or once again, from bullets. There’s even embalmed bodies, including that of notorious Thai serial killer, Si Ouey. There are two downsides to the museum. One is you can’t take photos inside, although thinking back on its contents now, maybe this is for the best. The other is the fact that mostly everything is in Thai, although this helps add to the intrigue as you’re doubly confused by what the hell you are actually looking at. I don’t even know what to say about this… apart from that I love it. Starting out as a small vegetable stand that also handed out condoms and contraceptives C&C restaurants can now be found around Thailand, Japan and England. Its aim is to promote family planning and the safe use of contraceptives, yet its manner of doing so is undeniably strange. There are condoms throughout the restaurant, fashioned into clothing for mannequins, into decorations for lights and very strange novelty animals. The decor is one thing, but the food is actually really good. It was a nice place to sit with a Margherita in the early afternoon, whilst taking in the sights. It also happens to have the best gift store that I’ve ever seen. I went a little bit mad in there and ended up coming away with a pretty good haul of the most pointless and interesting items. Worth it, for sure. One unusual thing to do in Bangkok is to airplane graveyard. I didn’t visit on this trip, because I was travelling solo and had my mother’s voice in my head, telling me not to go there alone and decided that she was probably right. This big, disused space has become a dumping group for old planes and a delight for visiting tourists wanting something a bit “offbeat”. Entry used to be free (as it was once but an abandoned lot), but apparently Thai families have set up shop in the area and now charge tourists for an hour’s exploration or so (apparently around 100 baht, so it’s not going to break the bank). I was more interested in things to do alone in Bangkok, so this is top of the list for next time I’m in the city, for sure. I’m bringing a friend. I dunno about you, but my travels around the world focus largely on food – the weirder the better, too. Insects in the Backyard certainly fit this bill. 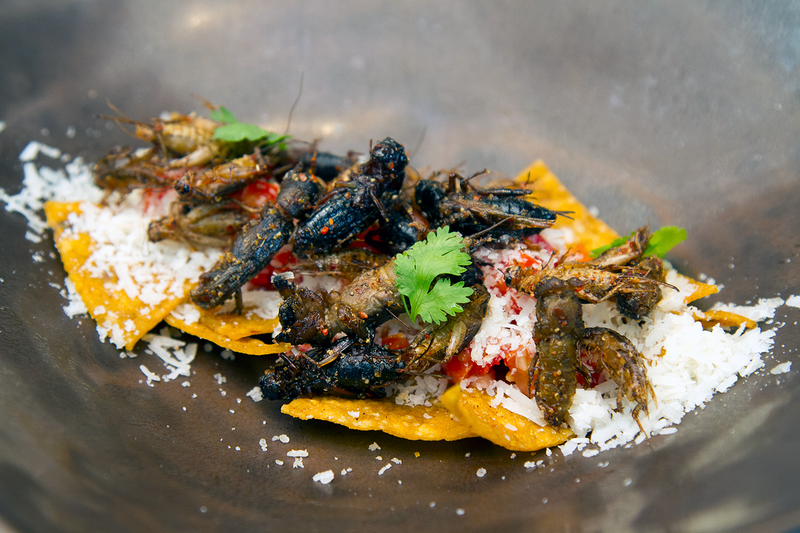 Touted as Thailand’s “first edible insect fine dining experience”, here you order plates of pretty traditional sounding meals – the twist being that the meat has been swapped out for insects. It can be a bit unnerving when you first settle down to eat, but every plate I had was utterly delicious – so long as I didn’t think too much about what I was specifically crunching on. It’s been said that one day we’ll be substituting our meat with insects and if it tastes anything like the meals I had here, then I am certainly all for it. There’s a giant plane in the middle of ChangChui, because why not? If you do make the pilgrimage out to Insects in the Backyard, reserve a bit of time to explore ChangChui, the market in which it is housed. 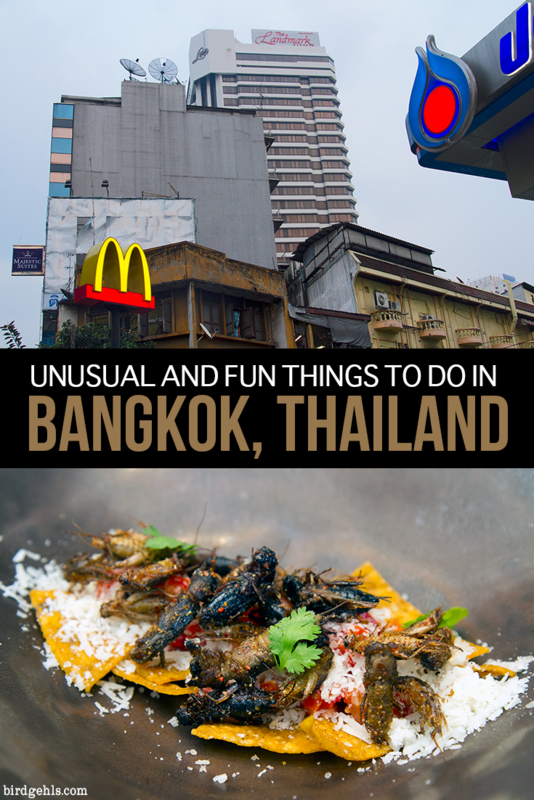 It’s definitely one of the most unusual things to do in Bangkok. This creative space features a plethora of activities – food stalls (where you can try things like custard toast – if only I had the room in my stomach at the time), novelty shops, bars, a cinema and theatre, art galleries, gardens, co-working spaces and even a barber. As someone who seriously digs sustainability, ChangChui is something to be marvelled at. The setting’s philosophy is all about reusing old materials and as such, employs the use of old window frames, glass windows and empty perfume bottles to put together this unique space. Some of the stores even sell wares that utilise this same ideal. I had my eye on a clock made out of elephant dung, but there was no way I was getting that past Australian customs. You’d expect a space like this to be thronging with people, but being relatively new and somewhat tucked away, it was very quiet when I visited during the day (although I’m sure it would be a fun thing to do in Bangkok at night). Entry is free, but as a warning, you’ll probably spend a bit of baht whilst exploring the various shops and food stalls. You’re only human, after all. So there you have it. These are just a few of the unusual things to do in Bangkok. Turns out it’s a very interesting city indeed. Do you know of any alternative things to do in Bangkok? What would you add to this list? If you like it, stick a pin in it. This is such an awesome and totally non touristy list of things. I love it. I am going to make it a point to check out the Air plane graveyard on my next visit and visit the C&C restaurant. I just want to go back to the C&C gift shop. Could have spent SO much money there! Wow those are certainly some quirky destinations! This was actually a really cool and fun list! Finally something fresh! Thank you for this list! Great post! I loved cabbage and condoms. It’s a cool atmosphere and the food was super delicious as well. Thanks! The food was so good, totally agree. I’m off on my fourth trip to Thailand, the airplane graveyard and Changchui has been added to my list. Thanks for the headsup and great post. Glad to help! The market is awesome, maybe head there a little later on in the day so you can maximise enjoyment. Have a fantastic time! I love this post, and can’t wait to go to these places! i think we travel in similar ways… oh, and I’d also love to live in Tasmania, except I was to get some miniature donkeys and build them a burrito barn. Thanks Monica! That’s an excellent idea. I think our farms should be next to each other, because I really want to pat those donkeys. I’m so impressed that you managed to eat those crunchy insects, I’m not sure my mind could get past what it is I’m munching on – I suspect I’d need to be in a survival situation… haha. Haha, what were you expecting? I was a bit surprised too, only one dish made me feel a bit sickly. It had ants in it. Gah, couldn’t. That would be so boring.